One of the real benefits of adventure bikes is that you can lug stuff around easily – whether that’s a load of camping gear to Africa, or the Christmas shop back from Sainsburys. Like most manufacturers these days, Triumph have a few ‘official’ options to choose from. The set most befitting the XCA model, in look at least, are the Expedition panniers. Made for Triumph by Givi, they’re constructed from 1.5mm aluminium, so they’re reasonably light. I actually smashed up a set on my old GS, so I can confirm they’re fairly strong and can be straightened out if needs be. As they’re the official bits, they can be configured to work with your ignition key, which is one less thing to lose plus they also pop on and off in a matter of seconds. They’re pretty handy in operation too, keeping your stuff safe and dry (although clumsy use of a pressure washer will infiltrate the seams). At 37l each they’re not the biggest panniers in the world – a weekend’s camping gear will fill them – but they’re big enough for most jobs. There’s a matching top box too, which is 42l and big enough to swallow a full face lid. The biggest downside is the price. The full set up pictured is over £1400 plus fitting. 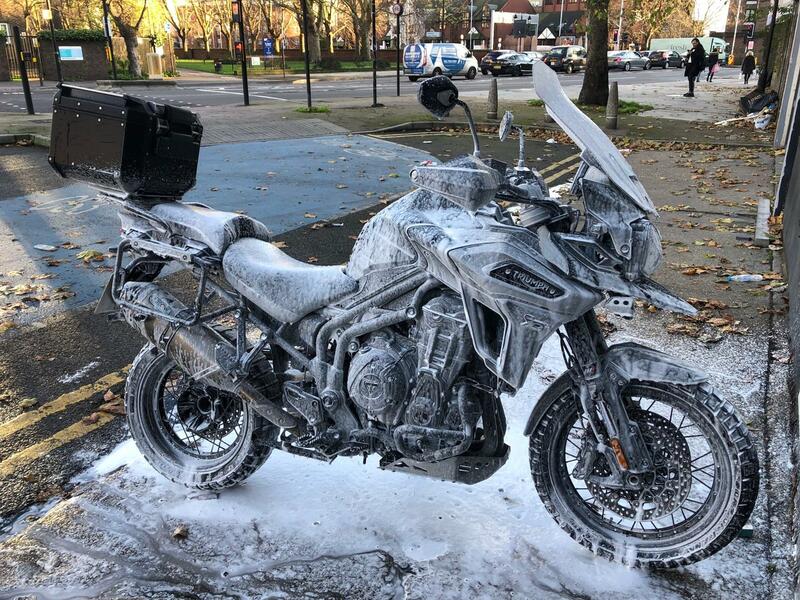 With winter currently well upon us and the threat of ice just around the corner, it’s that time of year when the roads end up covered in bike ruining salt. If you want to keep riding, it’s best to cover your bike in some sort of weather proofing spray. There are plenty on the market but the main players are ACF50, XCP Rust Blocker and Scottoiler FS365. This year, I thought I’d give the XCP a try and report back. You can apply XCP in a few ways and I’ve previously tried it in the spray can. While that works okay, it’s easy to over apply it and you end up having to wipe loads of excess off. After a bit of advice from some mates and the clever folks at XCP, I thought I’d try applying it with a spray gun and compressor this time around. The first step is to thoroughly clean and dry your bike, so the protector can get into all the nooks and crannies properly. For me this process was a quick squirt with the pressure washer (turned down a bit…), a coat of snow foam, another hose down, then the old school sponge and soapy water. 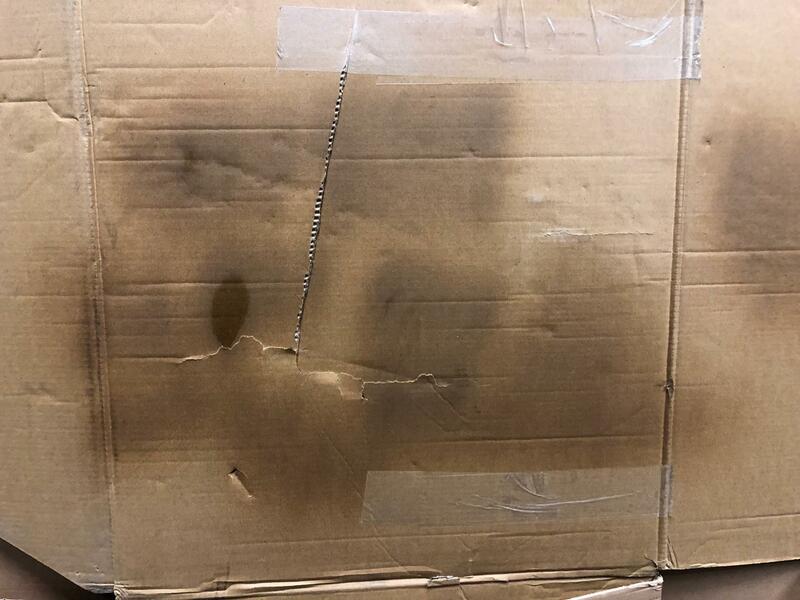 To dry it quickly, I ran the engine for a while and attacked it with some compressed air. Once the bike is dried off, it’s application time. After a bit of personal research, I settled on a gravity fed HVLP spray gun with a 1.8mm nozzle. I filled the hopper with about two egg cup fulls of XCP but actually used less than half that amount. The trick for a good application is balancing the pressure against the amount of XCP injected. Too much pressure and you risk overspray, while too little won’t create a fine mist that penetrates deeply. I practiced a little with a piece of cardboard until I got the correct consistency. It’s safer to go for less application and spray it on a few times because there’s no risk of it drying in the air like there is with paint. You have to feel a bit sorry for touring bikes these days. Unless you want a radio or a cup holder, there isn’t much a tourer can do that an adventure bike can’t. In the case of the Tiger, it positively excels. First up, it’s supremely comfortable. The saddle is a posterior dream and the pillion seat attracts glowing reviews from all those who sit on it (perhaps because they’ve turned the heated seat on in error). All the contact points are sensibly positioned and, like most big bikes these days, there are two saddle heights to choose from. It’s jam-packed with all the creature comforts you could ever need too including two power take-offs, heated seats, heated grips, a USB socket, cruise control and an electronically adjustable screen. Pah! You might think – who needs this crap? Well no one really needs it but on a cold and rainy slog up the M1, my god are you thankful for it. It could be just the ticket to convincing a reluctant other half. If you do succeed a bringing along a passenger, the luggage is comfortably big enough for two sets of everything. The electronics make things a cinch too. The semi-active suspension on the XCA is simple and effective to use. There’s a sliding scale for the damping between ‘comfort’ and ‘sport’ that I nearly always leave at maximum comfort because why not? It also automatically adjusts to loads, so whether you’re solo or fully-loaded it will always find the right setting. One unfortunate side-effect of this is that if you stop at a café two-up, when you come back, the rear-end is often still ‘jacked up’ making the initial remount a laborious and potentially embarrassing affair. However on the open road, the suspension makes the riding simply joyous and carefree, while the muscular engine means that you don’t need to think twice about making an overtake. For touring on the road, it’s a near ideal solution. On sweeping roads and motorways the Tiger is an absolute delight. It’s big mass melts away, leaving behind a comfortable but engaging ride. If you are going to stick to the road, which is what I’d honestly recommend, then save yourself £800 and go for the XRT model instead – it’s virtually the same minus the daft off-road dress up parts. With so many things to alter, plug in or warm up, the Tiger is a true technological marvel. Pillions love it and all the accessories quickly turn nervous passengers into dead-keen adventurers. The semi-active WP suspension is one of the Tiger’s most compelling aspects. It’s easy to adjust on the move and gives a velvety smooth ride. If it was a little quicker to respond, it would be faultless. The XCA suspension is no longer and the tank no larger – the adventure items are mostly a styling exercise. Spend the £800 on a trip away instead and you’ll be a lot happier. It begins with a low and even rumble. Then it morphs into a wild animal, screeching and growling. Next comes the induction roar as it gulps in oxygen. Finally you reach the full fat screaming as the needle tickles the redline. Brrp goes the quickshifter and it all starts again. And again. And again because the noise cuts straight to the petrol drinking lunatic inside you who steals control of your right hand. It turns out that a 1200cc triple with 139bhp on tap is the star of the show. Who would have guessed? In hindsight, I should have. The clues were right there when Triumph first unveiled the bike. They made over 100 changes to the 1200 for 2018, including a lighter flywheel and crank. The new lighter internals enable the engine to spin up much faster than the old engine, which was smooth but felt like it was stuck in treacle at times. I don’t want to sound all gushing, but it really has made all the difference and the result is bloody brilliant. Out on twisty A roads the engine is an absolute delight. If you want to take it easy you can cruise along in third and fourth, making ample progress on the 90ft lbs of torque. It even sounds great when you crack the throttle in the midrange too, with a hefty bark coming from the Arrow exhaust. If you’re up for it though, you can hold onto the gears right up to the redline, working that engine for all it’s worth. Because it’s got such long legs, you don’t have to hammer the gearbox like a maniac although when corners come thick and fast, the quickshifter/autoblipper is flawless. With the added benefit of a predictable electronic safety net, it’s some of the most carefree fun you can have on the road. But when you’re tired of all that and just need to get home, you can snick it into sixth, set the cruise control and relax into a relatively vibe free ride. 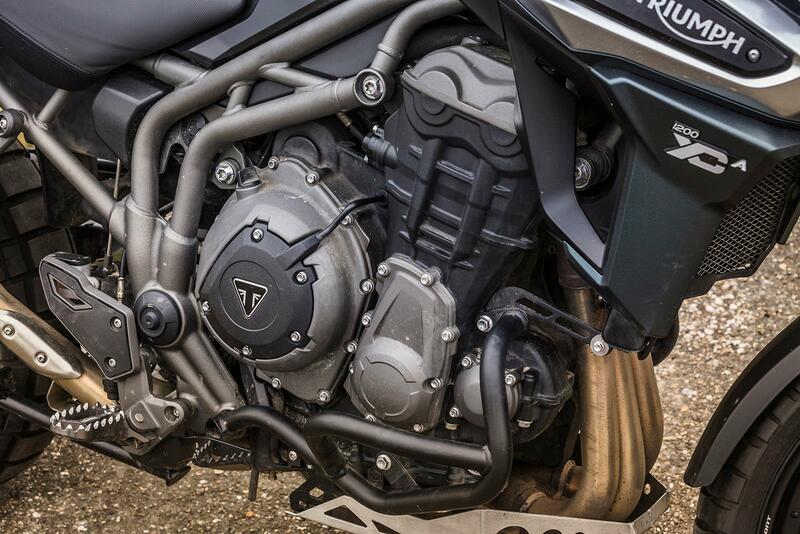 The only thing that has let the engine down since day one is a juddering clutch, although Triumph tell me that this is a known issue affecting very early models that has since been rectified. 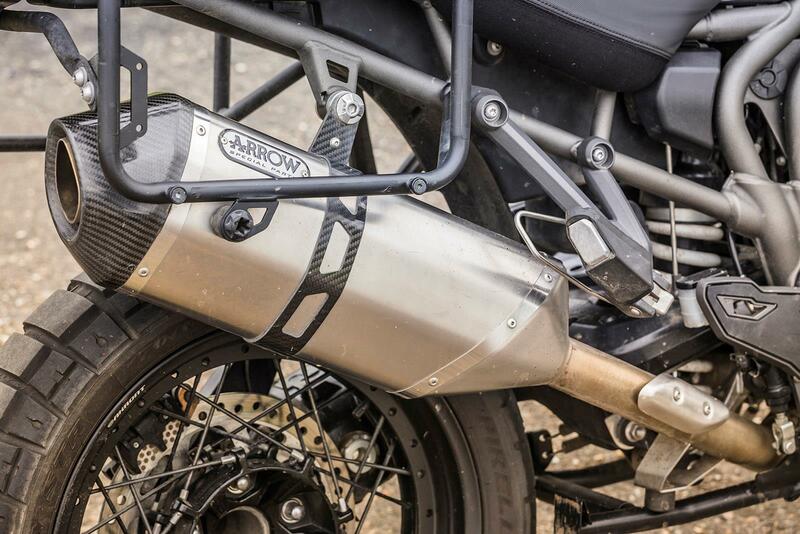 Of the current crop of adventure bikes, it’s got the best engine by a country mile. Our long-term @triumphuk #tiger1200 XCA is in for its 10,000 mile service today. Any questions about how it’s been so far? The next service due is 20,000 miles, which is the big one with a valve check, but I doubt I’ll reach that by the end of the year. With the standard seat in the lowest position the seat height is 835mm, which is 33”. For 5’6” me that means I can just about get the balls of my feet down on both sides but I can’t flat foot it. This does mean that it requires a little more care and attention, especially around town as I can’t sit on it and shuffle it backwards. Triumph offer a 20mm lower seat for £305, or there’s always the XRx Low model that goes down to 790mm. In short, yes. It’s a whopping 248kg dry, so in running order with a full tank it’s more like 275kg. Just hefting that off the sidestand is hard enough, never mind pushing it around or catching it if you have a little wobble. It’s made worse by the fact that the weight is high up too. Things have come a long way in the last six years. The XCa has a new engine, improved electronics, better brakes, electronic suspension, TFT dash plus a big power increase. There’s no doubting the new bike has some much more going on, it’s just that you pay for it in the price. The ride by wire throttle is an absolute delight, with no snatchiness anywhere. If you spend a long time in traffic, the clutch can get grabby when its hot and the radiator fan blows right into your crotch absolutely cooking you. For a big beast though, it’s quite civilised. The upfront costs of modern bikes can be eye-watering and the Tiger 1200 is no exception but they hold their value well don’t they? Well the market leaders do. Three-year-old Tigers sell for roughly £8000, meaning they half in value, which costs you £2600 a year on average. Feeling a bit faint? Luckily the rest of the costs are a little more palatable. The service schedules on modern engines never cease to amaze me and the Tiger 1200 is no exception. Once the 500 mile break-in service is out of the way, the first proper service isn’t due until 10,000 and even then it’s just fluids, filters and a throttle balance. Expect to pay around £350 for this plus any parts. The first really big service is due at 20,000 and that includes a valve check, new plugs and regreasing the headstock bearings, so expect to pay around £750 (more if the valves do require adjustment). Triumph say the oil in the final drive only needs to be swapped after break in, but after picking up the bill for a few shagged ones on BMWs, I’d err on the side of caution and ask for it to be swapped every 10,000 too. A few quid on oil could save you a fortune in the long run. As with all modern bikes, there’s also an annual service of to account for too, costing around £200. Assuming you do the average 4000 miles per year, expect servicing costs to work out at roughly £300-400 per year. In the most miraculous thing to have ever happened in bike tech, the MPG calculator is nearly spot on – just a shame the same can’t be said about the fuel gauge and range indicator. Because I’m peculiar (and tight) I tend to run a tank to the bitter end, which on average means I’ve ridden 210 miles for 18l of petrol averaging 53mpg. Not bad I’d say for such a behemoth. Two litres left is a bit annoying, especially since the reserve light comes on at 45 miles to go meaning you’ve really got around 70 to go. Tyres can make or break a bike. Cheap ones can ruin a ride and really bad ones often come bundled with a free trip along the tarmac. I quickly swapped the OEs for Pirelli Scorpion Rally STRs, which are a 70/30 on-road/off-road tyre. Unfortunately, a 248kg dry weight combined with a powerful 1200cc triple does meant that the tyres take a hammering, so the rears are past their best at 4000 miles. Assuming you’re getting one front for two rears and doing 4000 miles a year, tyres work out at £110 per year. 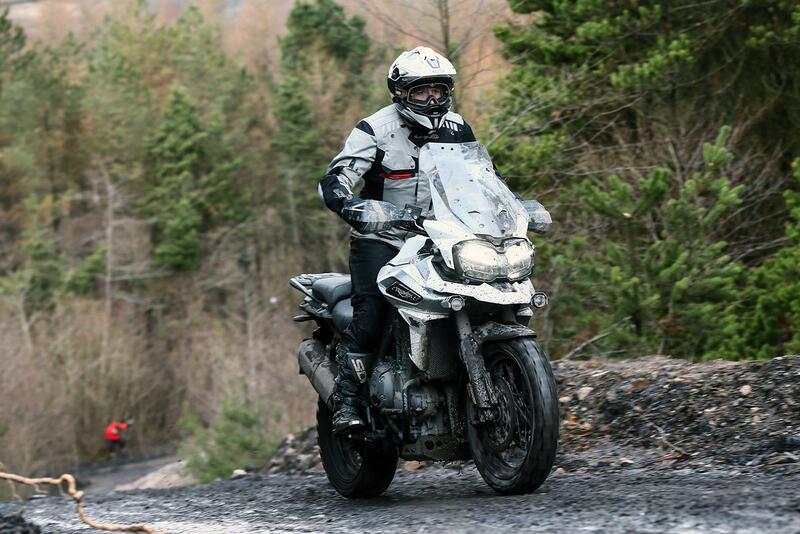 Earlier in the year, I took the Tiger to the Wales 500, which was an off-road adventure rally event aimed at large capacity adventure bikes. The bike performed admirably, although not flawlessly, but we’ll get to that in a couple of weeks. What the ride did highlight though was a need for some easily accessible storage plus easy accessory charging. 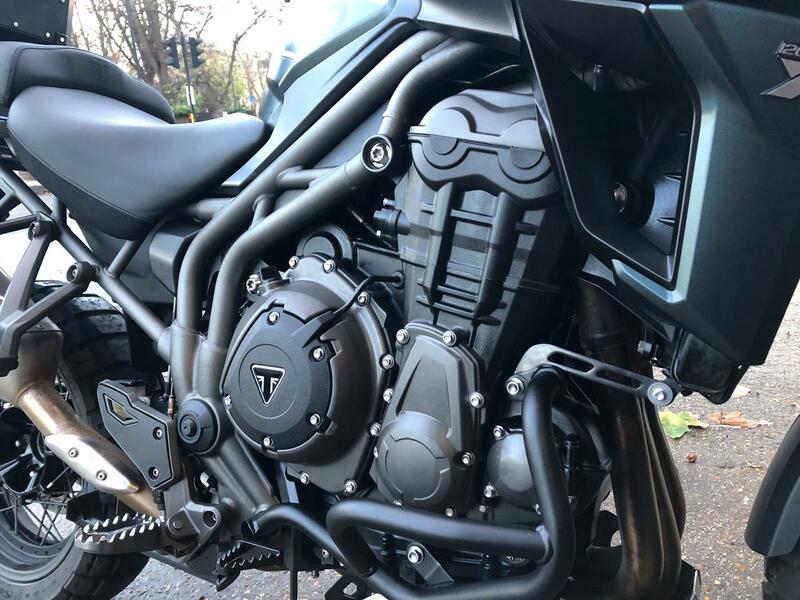 The Tiger has a couple of DIN plugs (one near the headstock and one by the passenger seat) but the placement makes them difficult to use for anything other than heated kit and leaves wires trailing everywhere. The solution for all my problems seemed to be a tank bag that has power and luckily, Givi lept to my rescue. For what I need, the catchily named Givi GRT705 (£135) seems ideal. It’s a waterproof 20lt tankbag, with a removable base from their Gravel-T range. It’s aimed at big enduro bikes, or adventure bikes, and the adjustable base means it will fit pretty much anything (and was a simple five minute affair on the Triumph). The real genius of it comes when combined with the S110 and S111 power hub, which places a hub in the middle of the tank back that has three USB slots plus a 12v DC. The design means that it stays waterproof but can also be removed in a matter of seconds. I’ve only given it a brief whirl so far, but it’s an impressive piece of kit. I’ll follow this up with a full review once I’ve logged some miles on it. 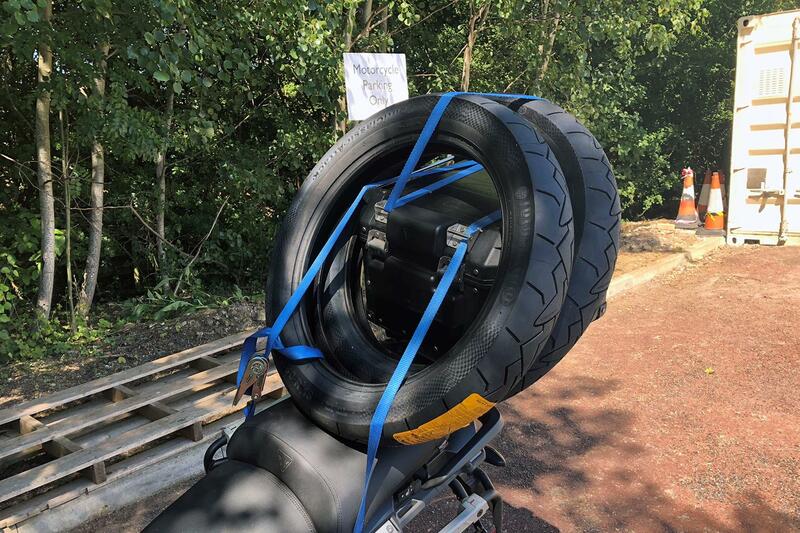 At the same time as I fitted the tank bag, I also used the Tiger to transport a pair of Continental Classic Attack tyres back from the office to fit to my 1977 BMW R100/7. 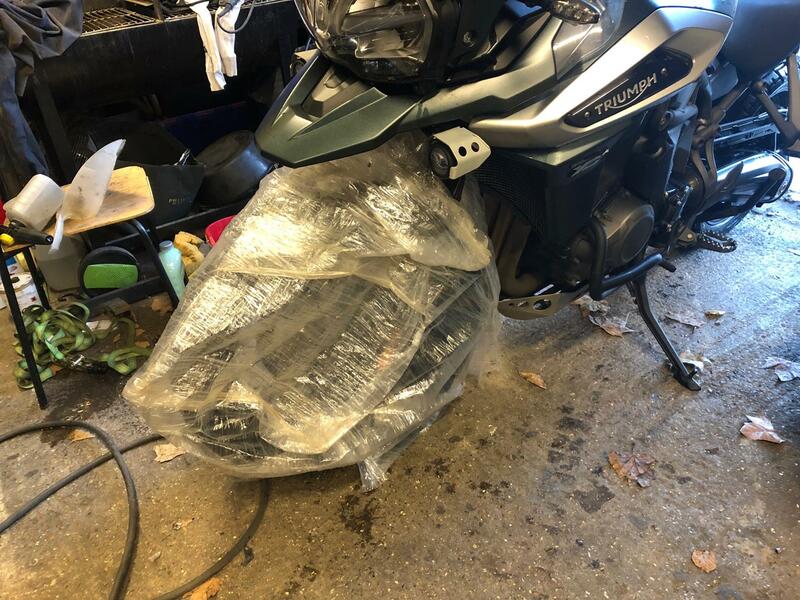 Thankfully it was a piece of cake because the Triumph luggage (also made by Givi) has a proper strap attachment points. It was simple a case of looping a tie-down strap around the tyres, through the top box loops and hooking it onto the pannier racks. In an age of cut down small super-nakeds, sometimes a bit adventure bike will lots of tie-down points is bloody useful. An adventure bike should be able to handle off-road riding reasonably well. If it can’t, then it’s basically just a tourer and the reality is that a purpose-made tourer is better at touring than a bad adventure bike is. Or so I think anyway. With that in mind, I spent a day at Triumph’s new Adventure Centre in Wales putting the XCA through its paces. The first thing that strikes you, and never really escapes you, is that the Tiger is a hefty old beast. The second you lift it off the stand you can feel every kilo bearing down on you and once you head off-road it really makes its presence felt. You really have to bully the thing to get it to do what you want and once it runs away, steps out of line or begins to topple over it’s bloody hard work to bring it back. Conversely, the engine was a real revelation. The flexible nature of the triple means it will pull from low down but it doesn’t run out of puff up top, so you can hold onto gears for a long time. In fact, I barely got the thing out of first gear all day, which if you’re new to off-roading is one less thing to worry about. It’s no doubt helped out by a great electronics package. The XCA just about earns its adventure name. For such a tank, it’s surprisingly adept off-road and can tackle terrain you might not imagine. Unfortunately, the rivals from BMW and KTM are much handier off-road, simply because of their weight advantage. 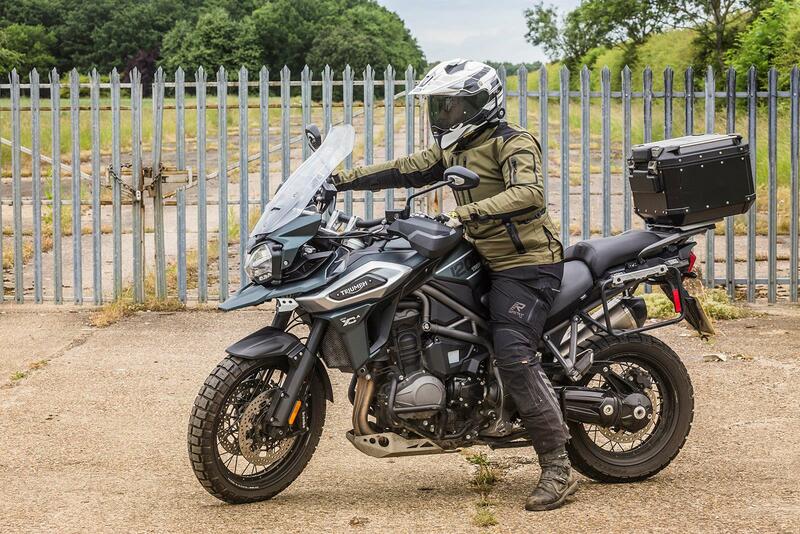 If you’re a road rider that might tackle the odd gravel track you’ll get on well with the Tiger but if you’re an off-roader on the lookout for an adventure bike, you’ll be better spending your money elsewhere. Off-Road mode allows you to tackle pretty much everything and feel like a hero with a decent safety net behind you. It’s the adjustability that won me over – in the end, I opted for Off-Road Pro but with the front ABS turned on and the throttle in ‘Rain Mode’ to calm down the power delivery. 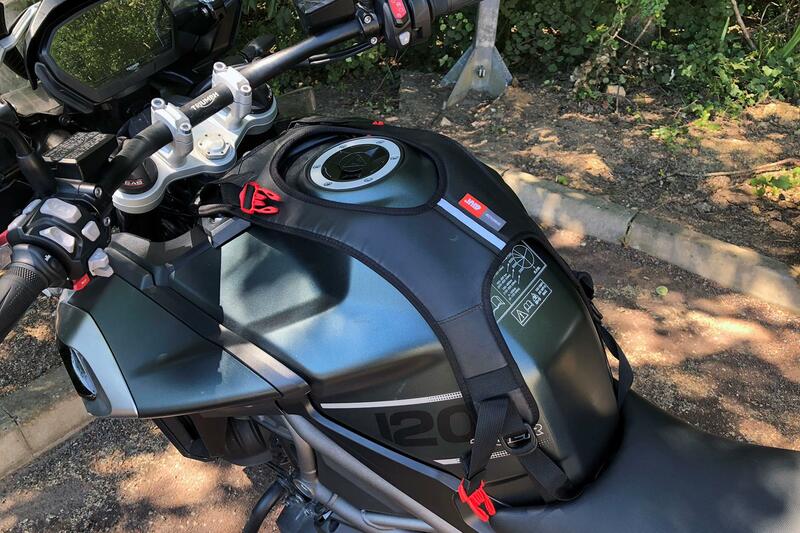 The XCA weighs a whopping 248kg done dry, which is outrageous considering a BMW R1200GSA is 263kg with 30l of fuel while a KTM 1290 Super Adventure R is just 217kg dry. The weight is high up too, exacerbating the problem. The suspension does a decent job most of the time but as soon as you drop off anything or the wheels leave the ground, it absolutely crashes back down to earth. Once again it comes up short with 190mm of travel compared to 210mm on the BMW and 220mm on the KTM.